Vamos Theatre has made a name for itself as a leading full mask company and it is impressive to see how much this production can achieve. 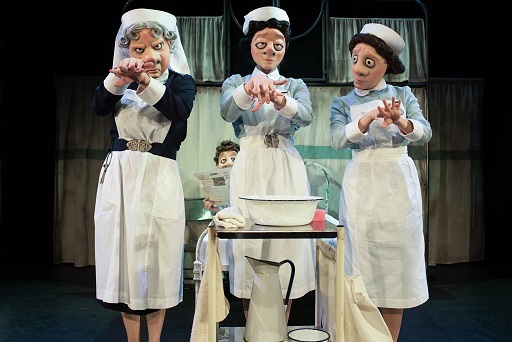 All of the characters in this gentle comedy about nursing in the 1940s wear masks and do not speak and yet there is never any doubt regarding what they are saying and feeling. The story begins in the 1980s when a grey-haired pensioner Old Flo arrives in a dilapidated hospital ward and handcuffs herself to the bed to prevent it being demolished. She then goes back in time to re-live her training and early experiences in the ward before the Second World War. There is plenty of humour as we see Young Flo's horrified reaction to her first bed pan and the terrible wounds experienced by her first patients. So too she has to cope with the dour-faced Matron who is a stickler for rules. But we also watch as Young Flo and her fellow nurse Fanny develop a friendship, fall in love with respective men and then face the fear of seeing their beloveds head off to war. There are some lovely moments in this production which will bring a smile to your face. Old Flo is befriended by the very workman she is trying to outface. Young Flo is wooed by an over-zealous serviceman. And Matron turns out to have her soft spots after all. But there is also plenty of sadness as we see the harsh reality of a regime in which penicillin was only available for service personnel and other patients were left to suffer. And, as the harsh reality of the war hits, even this hospital ward there are difficult choices to be made with sometimes terrible consequences. There is plenty to like in this production which features just four performers. The characterisation is inspired, the sets easily adaptable and the issues covered varied.